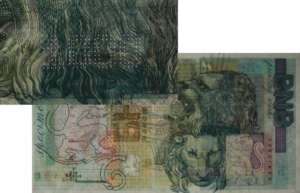 Banknotes security | KEIT ltd.
Counterfeited banknotes have a huge impact on a country’s national security and economy. In order to assist the National banks worldwide to prevent banknotes from a counterfeit KEIT has developed various security solution and security features. Based on our security Laser perforation numbering, Logo perforation and Encrypted marking we can provide a cost effective high level security for first line inspection and automatic control with mobile devices, smart phones or dedicated devices.